Fermentation transforms sweet ginger water into effervescent ginger beer. Mmmm! Honey, my sweetener of choice, is anti-bacterial. And if you're at all familiar with the process of lacto-fermentation, you'll know that (good) bacteria are essential. Lacto-fermentation occurs when beneficial bacteria and yeasts eat the sugar in a food and transform it into lactic acid. As they do this, the bacteria and yeasts also respirate (give off gases) and multiply. In this case, honey feeds the bacteria because it has sugars like glucose and fructose. Yet, honey itself is also anti-bacterial — in other words, it kills bacteria. So, wait, how are honey-sweetened natural sodas like this ginger beer, Kombucha, and Jun possible? I'll let you in on a secret… The key is dilution — and it unlocks a world full of bubbly, pizzazz-y, refined sugar-free beverages such as this honey-sweetened ginger beer! Some fermentation recipes call for granulated cane sugar (Rapadura, Sucanat, evaporated cane juice, white sugar, etc.) as the sweetener. So why use honey, if you have to worry about dilution? Honey is a GAPS-friendly sweetener, so families following the GAPS Diet can eat honey-sweetened ferments. Also, while most of the cane sugar is consumed during fermentation, some remains. For those with a sugar sensitivity, honey provides a way to enjoy natural fermented sodas! Chances are, you already have everything you need! *These glass Grolsch bottles are airtight so you can store ginger beer in the refrigerator for months without it losing carbonation. You can buy them online, or I've found them at thrift stores! The next best thing to Grolsch bottles are Mason jars with brand-new seals. It doesn't matter if the ring is new or not, but the seal needs to have plenty of wax on it to keep air out. Mason jars won't build up carbonation as well as Grolsch bottles, but the ginger beer will still be delicious. 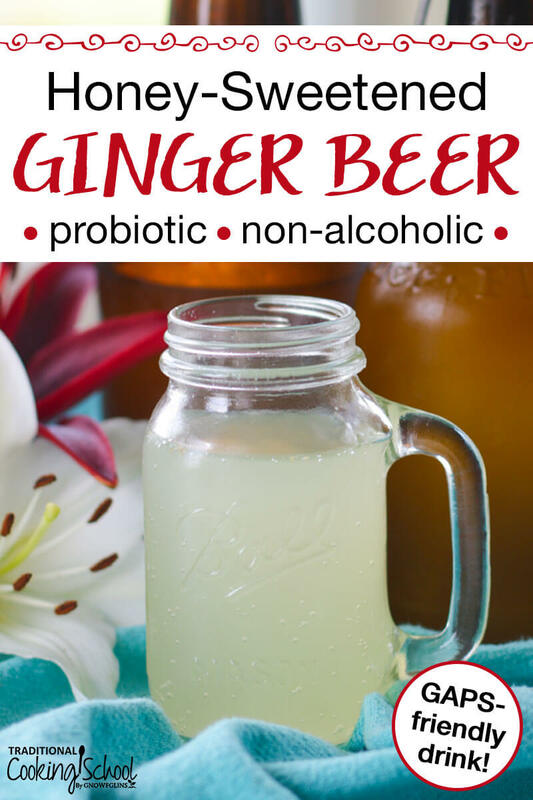 This Honey-Sweetened Ginger Beer is a probiotic, non-alcoholic, GAPS-friendly natural soda. And yes, it's a ferment sweetened with honey! Learn how this is possible so you can make this bubbly, pizzazz-y, traditionally fermented drink! There are three stages to making homemade soda: 1) make the starter a.k.a. ginger bug, 2) make the wort, and 3) bottling. Fill a quart-size jar with water about two-thirds full. Wash (but don’t peel) and grate the ginger. Add 1 tablespoon grated ginger to jar of water. Stir well to dissolve the honey and to incorporate lots of air. This ferment is aerobic and requires air. Cap the jar with a cheesecloth and rubber band (or sprout screen and metal band). Leave in a warm place to ferment (between 75 and 85 degrees Fahrenheit is best). Cover or insulate the jar with towels if it is a cooler time of year. You can also keep the starter on a seedling warming mat. Every 12 hours (morning and night), stir and taste your starter. Does it need another feeding? Is it too sweet? Is it too strong? You want to keep the mixture mildly gingery and slightly sweet. Depending on how it tastes, either hold off on feeding it or feed it about 1 tablespoon of grated ginger + 1 tablespoon honey + 2 tablespoons water (to keep the honey diluted). You may need to feed it every 24 hours or every couple of days. It takes anywhere from 3 to 7 days to get a strong ginger bug. The length of time depends on temperature, stirring, and honey content. It is ready when you see a layer of bubbles on the top of the starter, and it fizzes when you stir it. This is the carbonation releasing. If you ever notice that bubbles were forming but have since stopped, simply dilute the starter with more water. Add 1 cup ginger bug, 1/3 cup well-packed grated ginger root (plus more if desired), 1/3 cup lemon juice, and 3/4 cup honey to a gallon jar. Fill to the shoulder with water. This is now called the "wort" (soda before fermentation). Stir wort well to incorporate lots of air, and to dissolve the honey. Taste. It should be sweet and gingery, but not too strong. Cover with cheesecloth and rubber band. Allow to sit in a warm location, cover with towels, or keep on a seedling warming mat if the temperature is cooler. Stir every 12 hours (morning and night) for 3 to 7 days, tasting as you go. Add more honey if it loses all sweetness, but not too much because you want only a slightly sweet ginger beer. The wort is ready for bottling when there is a layer of bubbles on top, and it fizzes when you stir it. If you're not seeing any bubbles and your room temperature has been warm, add another cup of starter. Stir well. Give it another day or two for bubbles and fizz to form. Taste the wort and add any additional flavors such as dried fruit, preserves, overripe fruit, etc. Use a funnel with a strainer to fill swing-top Grolsch bottles or pint Mason jars to within 1-1/2 to 2 inches of the top. This will ensure that no bottles break as the carbonation builds up. Cap or cover the bottles or jars. Set aside in the same warm location where you fermented the bug and wort. Leave for 3 to 7 days, depending on the temperature. Open and test for done-ness on about day 3. If it fizzes, it's done! If not, cap and allow to sit for another 24 hours, then check again. Keep checking every day until the ginger beer is carbonated to your preference. The longer it sits, the less sweet it becomes. When done, refrigerate the bottles. What to do with leftover starter? After you make your wort, there will be leftover ginger bug. Keep feeding it (ginger + honey + water) for future batches of ginger beer. Or, if you don't plan on making any other batches of soda soon, add it all to the wort in one batch. Keep a close eye on your fruit-flavored sodas! Sealed carbonated things can blow up, especially fruit-flavored sodas. Cut their fermentation time in half, and watch them closely once capped. Open these bottles outside when checking for done-ness. Once done, refrigerate immediately. What is your favorite natural soda for summer? Wow, Haniya!! 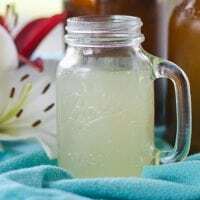 This honey-sweetened version of ginger beer is much-longed for by so many in the healing and wellness diets community!! A dream come true! How exciting!! Pinning! Thank you so much, Megan! <3 It's SUCH a fun recipe -- I've loved making it and drinking it! Congratulations on finding the way to make it with honey instead of sugar!! I’m going to give it a try!! Hey! So I am trying my hand at this recipe even though I’ve never made anything like this before! I have made the ginger bug and am in the wort stage (almost been 1 week) and it fizzes a lot, but there isn’t a layer of bubbles at the top. I can hear it fizzing whenever I go near and it fizzes when I stir it too. Unfortunately, I didn’t read far enough in your recipe and already used up all of the ginger bug so I don’t have the option of adding more starter… what would you recommend I do? Is it ok to add to the bottles or do I need the layer in order to do that step? Hi! No problem on the question — it’s a good one. 🙂 As with any naturally fermented beverage, it’s the yeast that creates the alcohol as a byproduct of the carbonation process. So the longer it ferments, and the more fizzy/bubbly it gets, the more alcohol produced. HOWEVER, it’s very minimal alcohol which is why ginger beer is usually classed as “non-alcoholic”. To reduce alcohol, you can reduce fermentation time and just deal with less fizziness (and more sweetness). Also, this may not be completely relevant, but when making water kefir (a.k.a. kefir soda) the alcohol is produced only during the bottling stage of fermentation (source: https://kellythekitchenkop.com/does-kefir-soda-have-alcohol/ ). So it doesn’t matter how long the drink was fermented prior to that. If that holds true for ginger beer as well, you can reduce bottling time to limit alcohol, and continue on with the rest of fermentation as normal. Thanks so much!! I really appreciate you getting back to me, and so quickly! I bottled it up and it sure has a lot of pressure when I opened it. It opened with a pop and sprayed all over (thankfully, I was outside)! It definitely has a strong beer taste… is that normal? My first ever batch of ginger beer I didn’t ferment as long (in the wort stage) and it turned out fairly sweet, yet still bubbly and delicious after bottling. My second batch, I left longer during the wort stage (because I didn’t have bottles free yet), and it acquired a slight “beer” smell but I went ahead with bottling anyway and it turned out fine. Less sweet then the first batch but it didn’t taste like beer, just sour and fermented. So I think maybe a shorter wort fermentation stage is the answer! That makes a lot of sense! I left mine in the wort stage for 1 week because I was unsure since it didn’t have that layer of bubbles at the top, even though it was actively fizzing… next time I will try leaving it for a shorter period of time! Thanks Haniya, for a detailed explanation. Your title says non alcoholic. If it fizzes it is from the carbon dioxide produced when yeast consumes glucose and the by product is alcohol and carbon dioxide; as well as from hetero fermentive strains of lactic acid bacteria which in the presence of oxygen choose the pathway of converting glucose into alcohol and carbon dioxide. Since we are stirring every 12 hours we are introducing oxygen which encourages yeast activity and hetero fermentive strains to produce alcohol; as well as introduces wild yeast. So, would you share what percentage of alcohol is in this ginger soda? 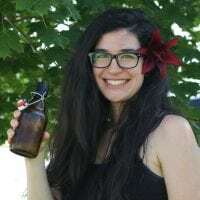 I make ginger beer in a similar way and can get about 5% ABV in a week, you will want to ferment for a shorter time if you don’t want the alcohol. Revision to my last comment, 3.5% ABV with that much honey.